While Val Kilmer gets top billing on the actor list, his role is more of a cameo and bit player than lead actor. 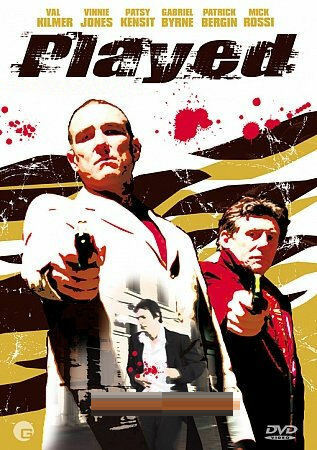 The Movie Mind went into this thinking there was a strong cast (Kilmer, Byrne [Usual Suspects], Vinne Jones [Gone in 60 Seconds / Lock, Stock and Two Smoking Barrels] who could turn a movie about London’s criminal underground into something interesting. Instead, the top-billed cast were next to non-existent and the movie comes off as a budget version of better movies. The lone surprise was a strong performance by newcomer Mick Rossi, who also wrote the film. I would be interested in seeing him in something new where he has a real ensemble cast surrounding him, and not trying to carry the film on his own. Played starts out extremely slow, almost to a painful crawl. The movie is very dark, lending some authenticity to the feel of London itself, regardless of the underground world, and the dialogue makes it very hard for all of us ‘Maricans who don’t speak Cockney. After we warm up to Rossi and begin to tie in some of the characters and how they interact with each other, it gets slightly intriguing. The problem is that it takes a long time to take the viewer there. There is a grainy, dirty look to the film itself, and with all the time warps they make a play at the Pulp Fiction style only a lot less intelligible and interesting. Once they get us interested in what is going to happen next and to the point where we actually understand what is going on, it turns to a drop-off ending that just got me really angry. I stuck it out through this whole thing and was led on only to have an ending where the movie just “stops”. Anyone who has been reading The Movie Mind reviews knows this is the quickest way to the doghouse. Don’t lead me on 90% of the way where I am forced to decipher a plot that is worse than Morse Code and then leave me hanging. If this is some kind or cruel British humor I’m not laughing. Dillon: Ray, you are not gonna taco.